Does it float or sink? Does it repel or attract? What happened to the cup of water? The class has conducted experiments to predict and discover which classroom objects float or sink using a bucket of water. The students analyzed their results by using terms such as “capacity,” “length,” “width,” and “weight.” Additionally, students worked with a partner, using a hand magnet to determine three objects that were made of metal and therefore attracted to the magnet or repelled. Lastly, the Kindergarten class has been exploring states of matter. Students have witnessed that water can be a solid, liquid, or a gas depending on temperature. Each class took ice cubes, transferred them to a cup and put it on the windowsill. To much amazement, the water was “disappearing”—or our new term, “evaporating.” Next up in science class: What happens to the water vapor? Stay tuned for the water cycle, clouds, and weather. In science class, students are studying earth science and beginning to write lab reports about what they learn during various science labs. Students enjoy hands-on experiments, which bring many new science vocabulary terms to life. As part of a rock study, students learned about the composition of rocks and how rocks and land can change over time. During a nature walk around the school, students were able to observe the effects of erosion right outside of our classroom door! Curiosity drives each science lesson as students begin to make connections between each topic they cover. Students connect their understanding of gravity to our study of erosion as they discover how gravity affects erosion. In science, students learned how to “think like a scientist” by asking questions, gathering information, making hypotheses, conducting experiments, observing and recording results, and then sharing those results. Through our studies of water and weather, students had the opportunity to learn about many of Earth’s fascinating features. In addition, second and third graders actively explored the hardness of various rocks and minerals using the scratch test method and Mohs’ number scale. Second graders had the opportunity to experience the scientific process first-hand, and learn from their third-grade peers about conducting and writing lab reports. This collaborative science lab was certainly a highlight of the second quarter! During the second quarter, the third graders have been studying earth science. While studying rocks and minerals, the third grade had a special joint lab activity with the Second Grade. During this activity, both grades worked together to determine the hardness of different materials by using the scratch test. The students then compared their findings with the Mohs Hardness Scale to determine the rank of hardness for each material tested. The second graders enjoyed a sneak peak into the world of third grade, and the third graders enjoyed being mentors to the second graders. The third graders are just wrapping up their exploration of our solar system. They have truly enjoyed learning facts about each planet and comparing them with each other. They completed a lab using scale models of the planets and compared their sizes and distances from the sun. They will study physical science during the third quarter. Topics will include measuring matter and being able to describe both its chemical and physical properties. They will be exploring what happens to matter when it’s combined in different ways. They will also study electricity, magnets, forces, and motion, and they will conclude the quarter learning about simple machines. 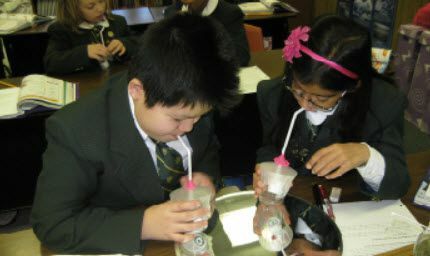 During the second quarter, the fourth-grade students studied earth science. They ended the quarter learning about the history of astronomy, stars, galaxies, and constellations. One area of focus was on many ancient and modern tools of astronomy. During one of their labs, they made their own astrolabes and used them to measure the angle of a star in the classroom. The classroom currently has the Northern Circumpolar Constellations displayed on the ceiling to enhance the children’s studies of constellations. These constellations also have stories included in their history curriculum. This provides another interesting curricular connection for the students. Fourth graders will study physical science in the third quarter. Students will learn how to use the Periodic Table and about many of the elements that make up our world. They will examine different properties of these elements and what happens to them when they are combined in different ways. They will then move on to learning about different types of energy, examining different sources of energy and how the different types relate to one another. In the second quarter, the fifth grade began to study the human body, one aspect at a time. Students began breaking down the individual components of the average cell in the body. The class then learned the structures and functions of organelles such as the nucleus, ribosomes, and mitochondria. After learning the components of a standard cell, they began to study more specialized cell types such as bone, muscle, and nerve tissues. Following the progression of increasing levels of organization, the class began to study organs and organ systems, beginning with those involved in the digestive tract. Not only did students identify the primary organs involved in digestion; but they also identified the secondary digestive organs that are responsible for producing specific enzymes to assist in digestion. The class is excited to move forward from slides and textbooks into a hands-on experience as they gear up for their first dissection! In the second quarter, the sixth grade will begin to investigate the physical properties of the Earth itself. In the beginning, the class looked at the different types of rock, which make up the crust of Earth. Each classification of rock is found in different parts of the world and has different uses in society. Students took a close look at the transformative properties of rocks and minerals and studied diamonds. The class learned about the powerful natural forces that must be in place for diamonds to form and how scientists all over the world raced to find ways to create diamonds in laboratories. The class also examined volcanic rock formations during volcanic activity as well as sinkhole formation from sedimentary rock formation and erosion. On December 2, the seventh grade took a science field trip into Washington, D.C. The all-day trip was divided into two parts: the first at the Museum of Natural History, and the second, on board a research vessel on the Potomac River. Along the river, students collected biotic (living) as well as abiotic (nonliving) data to test the river’s environmental quality and sustainability. While measuring the river’s dissolved oxygen, nutrient, salinity, and turbidity levels, students learned how these variables affect the quality of the environment. Students observed birds and even caught and handled various fish while learning how a diversity of species is a sign of a healthy environment. By the end of the day, Westminster students had gained a better appreciation of how humans can both positively and negatively affect the river’s ecosystem. The eighth-grade science classes are transitioning from chemistry into physics, where students will be challenged to better understand how our world works. They will get the chance to design objects such as boats, cars, and hydraulic devices using scientific principles learned in class. Students’ math skills will be put to the test daily as classes apply many of the mathematical principles that they have learned throughout their years and apply them to physics equations of motion and energy transfer.